Natural enemies occasionally band together, whether it's rivals playing side by side on the Dream Team, or John Stockton once wearing shorts too long for his junk to flop out one side of. 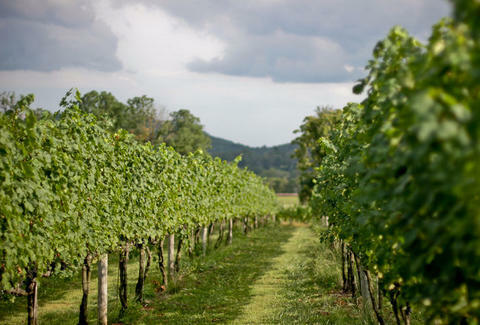 For a group of competing wineries seeing what they can do together, take a jaunt on the Rappahannock Wine Trail. Officially announcing their fermented fusion this weekend, the RWT's the union of five previously independent Virginian (...Rappahannock-ian) vineyards all within long-walking or super-short (designated!) driving distance of each other, who're putting aside their naturally competitive situation to offer up a "premium wine tasting experience rooted in small lot, handcrafted wines", even though that weird groaning woman from the news would suggest they're footcrafted. All under an hour outside DC, the alliance includes larger-ish vineyards like the 51-acre, 3000 case/year Narmada Winery, plus meats/cheese-pairing Rappahannock Cellars, a sprawling operation that relocated from CA to VA in 2001 after recognizing "the promise in Virginia wines", which is hopefully stronger than the ones made while drinking them. Super-small artisanry's repped by Chester Gap Cellars, who boast the Blue Mountain views from their "open-air tasting patio", local cheese/summer sausage basket-peddling Gadino Cellars (owned by a family with 100 years of wine biz experience), and the uber small-batch Sharp Rock Vineyards, whose 12 offerings're available online and in their tasting room, confirming what their name implies: skipping them would be a bad idea. Like any good union, they're starting things off with a big party this Saturday and Sunday, with grass-fed burgers, live music, and tickets that'll get you your pick of 10 wines, letting you select a veritable Dream Team, after Mullin things over.